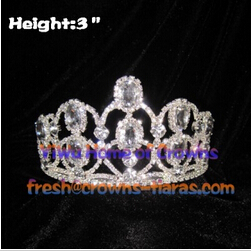 3inch Pageant Crowns with all clear rhinestones and big clear diamond, The color of big diamond could be change into red,blue,ab stones, all depends on your request. Pageant Crown is a luxury jewelry, mainly for the event. For every beauty contest, girls will be very beautiful to wear Crowns. Our company can provide a variety of sizes beauty crowns. We have Halloween Crowns,Christmas Crowns,Queen Crowns etc.. Previous: Crystal Crown is absolutely gorgeous!